Brothers William and Frederick Langenheim of Philadelphia introduced a new process in 1849 they called hyalotype to produce glass lantern slides. These slides were mounted for individual viewing or projected using a magic lantern. Hyalotypes were highly detailed and accurate, and were considered "truly astonishing" and "near perfection." 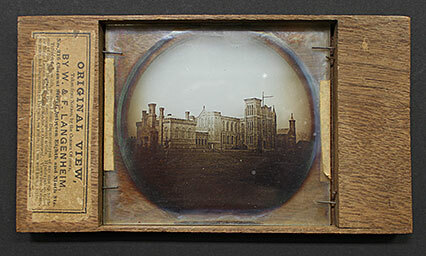 This extraordinary photograph, taken in 1850 during the Castle’s construction, is the earliest known view of the building. It was among 126 views published by the Langenheim brothers in 1850, several of which were later exhibited at the 1851 Crystal Palace Exposition in London, where they received high praise.